Home > WhatsApp Tips and Tricks > How to Add Contacts in WhatsApp with WhatsApp Web? The WhatsApp Web is an amazing tool that is given by WhatsApp which lets us open the WhatsApp chats even in our desktops if we don’t like to chat through the phone. This saves a huge amount of effort as well as the tine which would have been wasted trying to bring the things from phone to the desktop. However, not everyone knows how to add someone on WhatsApp just by WhatsApp web. 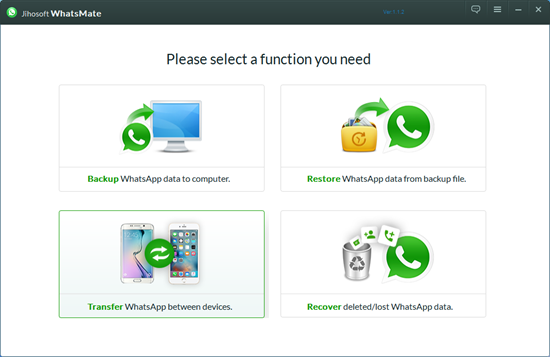 Tip: Never worry about WhatsApp contact lose, because this WhatsApp manager can help you backup and even recover WhatsApp contacts. Also it’s just a piece of cake for it to transfer WhatsApp data between Android and iPhone. You might not have your phone with you always so this feature is really helpful if you want to add new WhatsApp contacts even when you are accessing the WhatsApp on the web from your PC. So let us take a look at some of the tools that is going to make your task easier. Those tools are completely free and can be downloaded from anywhere you want, let us check them out. The InTouchApp is a really popular app that people use to manage their WhatsApp contacts. The best part is that this app is available both for Android as well as the iOS devices. The process is very similar to both the apps, however, let us take a look at how you can easily use this app to update your WhatsApp contacts. Step 1. Search and download this app from the Play Store. If your Google Play Store is not working, you have to fix it first. Step 2. Once you have installed, open the application and then sign up for a completely new account. After this comes to the most crucial step. Step 3. Sync your contacts with the app. You will need to give some other details like email ID or the number that is linked to your WhatsApp. After all of these has been done then click on the Settings icon that you find right on top of this app. Step 4. 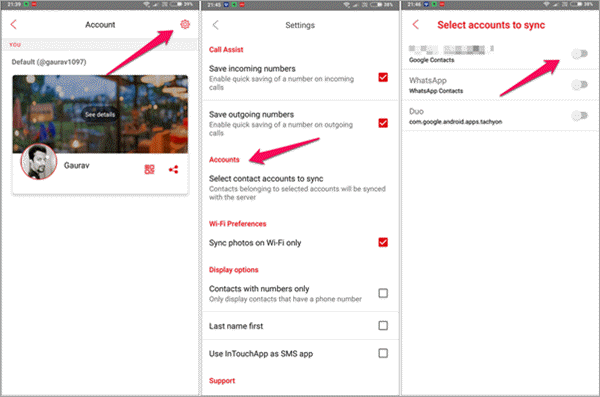 You will find the Accounts section under which there is a sync option which you need to click on to make sure that your Gmail is completely synced with this particular application. This is the step that is actually going to help you add contacts in WhatsApp desktop. So after all of this has been done, you will be easily able to access the contacts and update them from the WhatsApp Web page on your desktop. The process is very similar and simple even on iPhone as well, and your job will be done easily in just a few clicks of a button. Having the same maker as that of the ones which made the Intouch app, WhatsApp Lead Manager is an Chrome extension that should be installed on your Google Chrome. Once you have installed it, you will be able to manage to bring from your contacts to your leads and save them right in the clouds. After you have installed the extensions, you will see the new icon appearing on the status bar, and you are going to be good with it. This extension is really helpful and will help you to back up everything on your cloud and access them whenever and wherever you need. However, this extension can be a bit tricky to download for some people so you can check out the guide that is given in order to download the crx file from the web store. Even though this is a really easy way, there are various other foolproof ways which you can implement in order to update your contacts. So let us take a look at them now. 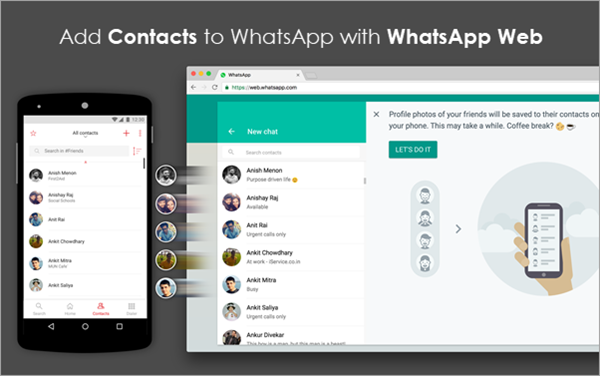 If you don’t want to use any kind of third-party apps on your phone, then this is the best way by which you can save contacts using WhatsApp Web, as WhatsApp on the web now lets you manage your contacts directly. When you open the WhatsApp Web in a new chrome tab or a completely new window, then you will see a code there. You can scan this code to connect it directly to your mobile and then open the application from your smartphone. All you need to do is to click on the 3 dot icons on top and then choose the WhatsApp Web option that you see there. Note: However, if you are an iPhone user, you will need to go to the Settings options on the bottom and then select the WhatsApp Web option from there to proceed any further. 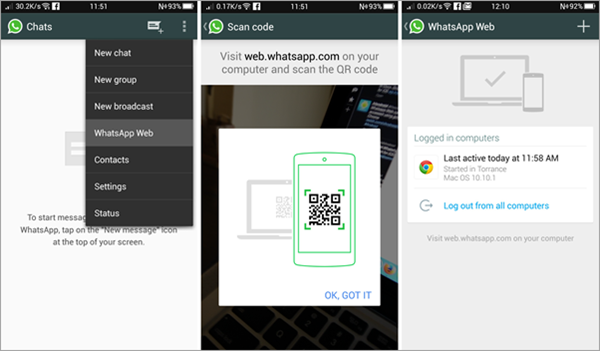 After the code has been scanned by the phone on which you are using the WhatsApp Web, you will automatically get signed in. Then you will be able to see all of your contacts as well as the chats right on the browser without any kind of extra effort. However, let us assume that you got a new message from a person whose number you don’t have saved in your phone. Then can you think what will happen? 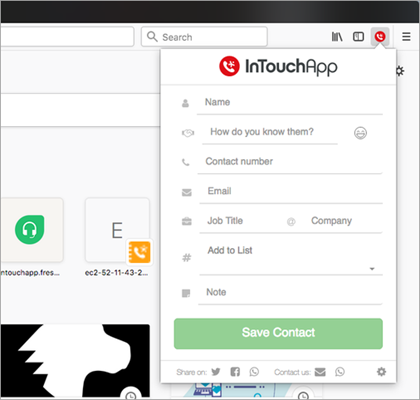 Well, you will need to click on the InTouchApp extension that you have already installed in the previous steps and login if you are a first time user. You can click on the extension once again when you see that you are on WhatsApp web and then you will come across the option called save the contact. You will need to enter all the details of the person and then click on the save option that you see over there, syncing the phone as well as the web together usually takes a bit of time to make sure you don’t get impatient in between this time and stay calm, the contact should appear both in your phone as well as the contact section of your WhatsApp on the web. You will also see the name appearing in the WhatsApp chats after a few seconds of saving the number and in this way you can accomplish your task. Tip: After adding your contacts to WhatsApp with WhatsApp on the web, now just try to schedule your WhatsApp messages to have more fun. Everyone receives messages from unknown numbers, if not every day at least once in a while. But what was a hassle previously, to save the numbers from the web directly has now become an immensely easy thing to do. So without wasting any more time and being lazy, you can actually follow the 3 options as that have been mentioned above to get the results that you want. This process is completely tried and tested, and there is no way in which this method can fail. Another thing that a lot of people worry about is whether it is safe or not to use third-party applications on the phone for updating the contacts. While you should never trust all the apps but the InTouchApp. It is something genuine which is not going to cause your device any harm. This guide is going to be really helpful for all the people who were looking for a solution to this problem for a really long time. Hope you will be amazed at the results produced.